I'm more or less between projects at the moment, so today has been a day for play and putzing about. Awhile ago Nellie Durand posted a tutorial to make these cute little birds and I've been saving the instructions for a rainy day (which it happens to be doing right now!). It's another case of using what I have in my stash so the legs & feet aren't quite what Nellie used, but they don't look too bad. I ended up having to weave fine wire in and around the joins in the feet and have also added a spot o' glue to hold them in position. All the same, my birdie takes a beak-dive every little while (guess he's been imbibing altogether too many rotten berries). The tutorial can be found on Nellie's site here: http://nelliedurand.blogspot.com Look in her sidebar under 'Labels' for the 'Birds' listing and you'll find it. And..while you're there, check out Nellie's Lake series!!! Thanks Nellie for the great tute. These two pictures are of the page I made for the next round of the book challenge our CQTeers groups is doing. This page is for Kym. The front is from an old pattern for a pillowcase...the skirt is crocheted with tatting thread. I used good ol' crayons to colour the bodice and hat and then did some embroidery to highlight. The hair was pretty easy - I just wrapped pearl cotton around a metal knitting needle, dampened it, sprayed it with hair spray and then heat set it with my heat gun. The back of the page is a scan of one of the birth cards I found the other day while I was cleaning out 'stuff'. I think these might just show up in a lot of my work for awhile!! As for the blind-numbing part of this post, I finished the binding on the quilt but have to admit that blind stitch done on that much area quite simply numbs the mind!! It's one project I'm very happy to put behind me. I'm SO lucky to have friends! Today was our CQTeer meeting and I now consider myself one of the luckiest persons in the world!! 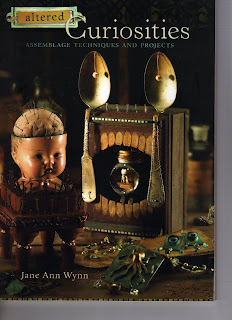 I have coveted this book for several years and have tried very hard to get it through various means with no luck. My friend Irene found a copy on her shelf and gave it to me!! I can't believe my good fortune and how very blessed I am to have friends like her. I shall treasure this and can't wait to actually read it. I've been commissioned to put the binding on this lovely quilt and today I undertook to start stitching it on. The quilt owner had cut the binding pieces and as I sewed, I sweated, because I knew there wasn't any more fabric! I had precisely 8 1/2 inches left as the photo can attest. Talk about cutting it (pun intended) close!! Now I have the mind-numbing chore of handstitching the rest of it down. Isn't this just too cute for words? 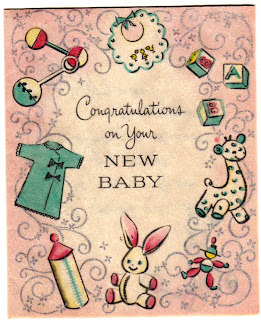 I stumbled across a box of cards I got when I was born and this is one of many cute ones. It's a Hallmark card and cost all of 10 cents. My how things have changed!! I really need to think of something artistic I can do with them because I really don't want to throw them out. We happened upon a yard sale today and found this. She is an Avon Mrs Albee figurine dating from 1983/84 and this one happens to come from South America. How it got to Canada is anybody's guess but nevertheless she's here and now lives at my house. I was an Avon rep for a little over eight years and managed to earn one of these figurines for each year. They are made to honour the very first Avon rep (Mrs Albee) and are given out to those reps who 'make' President's Club (meaning you reach a certain target of sales). They are very much like the Royal Doultons, but the glaze on these is more matte. I think they are more valuable because we needed to work so hard in order to earn one. I really wish I knew how this one came to be here from South America. "My name is Mary Anne and I'm a bookaholic"
and I really need a 12-Step program for bookaholics. I did it again. 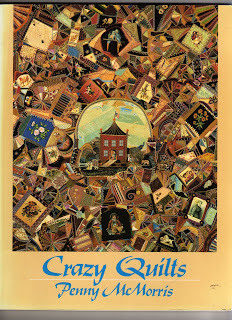 I'm putting the entire blame on my friend Florence who found a new-to-me J. Marsha Michler crazy quiltng book (called Crazy Quilt Decor) and I absolutely have to have a copy in my collection. So...I HAD to go to the bookstore, right? While I was there I checked out the used book section (you never know, the book I wanted might have been there, right???). It wasn't, but Altered Curiosities was. It followed me to the checkout and insisted on coming home with me. As if that weren't bad enough, I ended up ordering the brand-new J.M.Michler book that's just out. They couldn't find the Decor one I was originally after so...I checked out the used books on Amazon when I got home. There's no hope...I'm a lost cause. Today was one of those days where I accomplished very little that I can talk about. Not that I can't talk about it - it's just that it would bore you to tears. 1. There's no picture today because the only thing I managed to actually do today was put a few rows of knitting on my Einstein sweater. Right now it just looks like a reddish-coloured blob of knitting. 2. The other thing I did was to clean out my china cabinet and the buffet in the dining room. I managed to put a few things aside for the yard sale though, so it wasn't a complete waste of time. 3. It's cold. We still have the furnace on and it's simply just too cool to contemplate putting any plants in the garden. The 'orchard' (all of 4 little trees) is in blossom but we're so afraid the frost will kill them off. I suppose that once we do get some warmth it will hit with a vengeance. - http://www.needlenthread.com Mary Corbet writes an interesting blog about needlework and today she has an entry showing (and describing) a beautiful piece of goldwork. Well worth seeing! - http://alliesinstitches.blogspot.com I know I've pointed you here before, but do go and check out Allison's latest crazy quilt creation. She does very beautiful work!! 5. Finally - for those who read Stephanie Pearl-McPhee's blog ( www.yarnharlot.ca) and/or Franklin at http://the-panopticon.blogspot.com note the birthday celebration that will be taking place to celebrate one of 'those' birthdays for the Harlot. Franklin will be coming to Toronto and doing a photoshoot for his 1000 Knitters project and has left a slot for 120 local knitters to be photographed...all in honour of her birthday. There's lots of fun planned, so if you want to read more about it check out Stephanie's blog for more info. I finished the TIF May challenge piece! I have to admit that pale pink is not one of my favourite colours so this one was a bit harder to work on than the others have been. I must make mention that in the bottom left corner I've used a treatment from 'Treasury of Crazy Quilt Stitches' by Carole Samples (in the ivory area right on the corner). Another of her patterns is to the right of the deep pink at the bottom (looks somewhat like stars). The seam treatment between the ivory and deep pink on the lower right is from the 'Elegant Crazy Quilt Seam Treatments' e-book by Pam Kellogg. The little motif directly above the seam treatment (between it and the ciggie silk) is also from Pam. http://kittyandmedesigns.blogspot.com/ for more information on the ebook. Picture is clickable to enlarge. The second picture is of one of my orchid cactus flowers (thanks Arlee for the plant ID). This plant and the pink one both have been absolutely drenched in blossoms this year. I, of course, being a twit, forgot to take pictures when they were at their best. Drat! Hope you like it. Sorry about the no-post yesterday...my internet connection wasn't working properly. Here's the progress I've made on the TIF challenge piece for May. Click to enlarge so you can see it better. The seam treatment to the upper right of the centre ivory section is taken from Annie's Crazy World blog (whose addy I thought I had and can't find - googling it will find it for you I'm sure); the seam treatment between the light pink and hot pink on the right of the block is from Carole Sample's book (Treasury of Crazy Quilt Stitches) and I'm currently working on the lower left seam using a pattern from Pam Kellogg's 'Elegant Crazy Quilt Seam Treatments' e-book. This block isn't my choice of colours but what I like about this challenge is that Sharon is guiding me into combinations I would never try on my own. - Sharon B has created a new site which is open to anyone interested in textiles. It very much puts me in mind of the format that they are using on Ravelry and I wonder if this will be as wildly successful. Anyway, more info can be found at http://stitchinfingers.ning.com So far it's looking pretty good. I know, I know. I said I was downsizing. However this book leaped off the shelf in the bookstore and glued itself to my hand. It's one of those bookstores that has the buzzer system. You know the ones? They have that LOUD sound that goes off when somebody tries to steal something (or even sometimes when you're totally innocent and then scares the pants off you?). Well, I knew I wouldn't make it out the door with a book glued to my hand, so I figured I'd best pay for it. I love it! 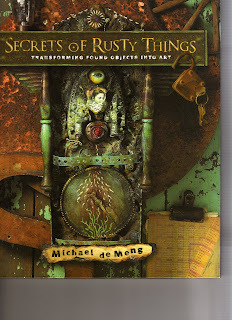 Michael de Meng is a fabulous author and artist and he has produced a book that is very readable, along with eye candy to inspire anyone. He has a great sense of humour which comes out in his writing too. I can't believe this is what it looks like now! For those of you who have forgotten the 'before' picture, please scroll down. Ten whole drawers of fabric are gone AND two dressers are in the garage awaiting the yard sale. In this picture you can see the extent of my denim collection, which will also be down-sizing over the next few months (I hope). Even the cat is happy because now his 'pooter bowl' is tucked in the corner so he can have some privacy!! I want a housekeeper!!! However, on the good side, I have reduced my stash to fit into just 6 drawers as opposed to all these shown in the picture. On the bad side, see that pile on the floor and the worktable? What you can't see is that there are three garbage bags full of 'stuff' in behind the pile you CAN see!! It's just plain disgusting. Stay tuned for 'after' pictures! My friend Marie and her sister Cathy dropped in this afternoon and ended up having a total blast going through my cast-offs and took a whole smash home with them (don't worry, there's plenty left!!). It was almost as good as Christmas here for awhile and was SUCH fun. I can't wait to see what they do with what they carted home. Mind you, I wouldn't want to be in their shoes having to sneak their booty past their husbands! Marie has a blog at http://sredeluxe.blogspot.com and Cathy will soon have a whole lot of one-of-a-kind pieces for sale on E-bay. Once she gets everything set up, hopefully she will send me the info and I can pass it on to you. I can guarantee her work is awesome because it's pretty obvious the creative gene runs in the family. Marie has been busy creating the most wonderful seam treatments using beads and word has it that she will be selling her designs over the internet. I'll keep you posted on that one too. See this pile of fabric bits? Well, that's the castoffs from only the purple and the white drawers!! And that's not all either, because there's another pile of pieces that are just too big and are destined for the yard sale. 4 drawers are done and there's 11 more to go...sigh. Now the huge decision has to be made as to what I'm going to DO with the leftovers. Donna at http://quiltpixie.blogspot.com is using her stash to create a wonderful cq-ish quilt, which is a great idea. However...I have too MUCH and I simply don't have the time to sew it all up into anything. Fortunately we have a fabric recyling pickup in our area, so I suspect that's where the majority of this will go. HOW can one woman manage to accumulate so much??!! Hi-Ho...a shovelling we will go! 'Tis yard sale season. We haven't had a sale for nine years so it's high time and I'm working on shovelling out the house. That 'pile' beneath the table is on its way out and the pile on top is being gone through with a critical eye to getting rid of a bunch more. I won't overwhelm you by showing you a picture of the large pile already earmarked for the sale that's being stored in another room!! Believe me, you don't want to see it. There's an ulterior motive here too...we're hoping that my dad will be convinced that there's really a lot of junk in the garage that isn't needed. He is no longer able to fix things and all the junk (oh, mustn't call it that...it's all 'good' for something...boat anchors maybe???) isn't serving any purpose. We have a very large garage ( could hold 4 cars) and it's jammed full of his old rusty parts for things. Jack is just champing at the bit to get rid of a lot of it. Did I mention that there's an attic in the garage and it's full too?? AND there's a garden shed too?? Yeah, I think you see the dilemma we're in!! Isn't that a nice big word for a title? Isn't it better than just saying 'mumblings', because that's all I have for today! This display is above a cupboard in our cellarway and is a mixture of old and new. The clock, irons, and the accordion are all old. I know the clock probably works, but the key has been lost over the years. The picture is actually of us...taken when the kids were small...and Jack made the frame out of old barnboard. Most people think it's actually an antique picture. The two wooden goblets and the bear are all newish. The bear has actually been coated with scented wax which acts as a room freshener. 1. I covet the knitting needles available on this site: (www.signatureneedlearts.com) I will continue to covet them from afar because they are way expensive!! 2. Here's another interesting possibility for you: www.supercook.com You can put in a list of ingredients and it will give you recipie ideas. I have the TIF challenge already pieced for May and today is just the 1st!! Of course that's not to say that I will have it embellished anytime soon. Unfortunately the colours seem to be showing up dark in this picture. Some of these colours were difficult to find in my stash, particularly the light blue-ish colour, however I think I have come relatively close. Luckily I have a pretty cigarette silk that 'goes' perfectly. The other picture is the cover of a little booklet that I got from Irene yesterday. I absolutely love (AND collect!) anything pertaining to embroidery stitches so this was a real treat. Unfortunately there is no date inside to say when it was published. It cost the princely sum of 15 cents anyway. Thanks Irene! !